Height added to desk 5.25"
I have carpet in my work area. Will these roll over carpet? In most cases, yes. Our Heavy Duty Locking Casters will still roll on most types of carpet, as long as your desk is not too heavy. Will these make my desk less stable? No, using casters will not make your desk less stable. In fact, these heavy duty casters can help keep your desk stable, even more so than traditional desk casters. This is ideal if your desk is set up on an uneven surface or in an environment with a floor that is not perfectly level, such as in a warehouse. Yes, these casters securely lock, letting you keep your workstation stationery once it's in its place. 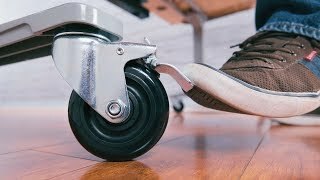 The best part is locking casters can be done with a foot, letting you lock it without having to bend down and break your ergonomic posture. What is the weight capacity for each wheel? Each Heavy Duty Locking Caster can hold up to 265 pounds, perfect for supporting tables with heavy loads and larger workstations. Can I buy a single caster? Yes, if you lost one and need just one caster, reach out to us and we'll be able to assist you. Can I still move the desk without casters? We do not recommend this, as the only way to safely push your desk to a new position is with proper casters for your workstation and environment. If you push your desk without casters attached, its likely that you may damage the structural components inside of your frame and harm the integrity of your desk. You can purchase UPLIFT Desk casters in any amount you want, as long as that amount is 4 or 5 casters. These outfit UPLIFT Desk models for better mobility and added height, whether you work at a 2-Leg, 3-Leg, or 4-Leg desk.